October of 2011 brought our first look at Bradley Cooper and Zoe Saldana in the new drama The Words, but with the film making its premiere as the closing night film of the the 2012 Sundance Film Festival (Alex and myself will begin our full coverage from Park City, Utah next week), it's time to get the buzz going full blast. 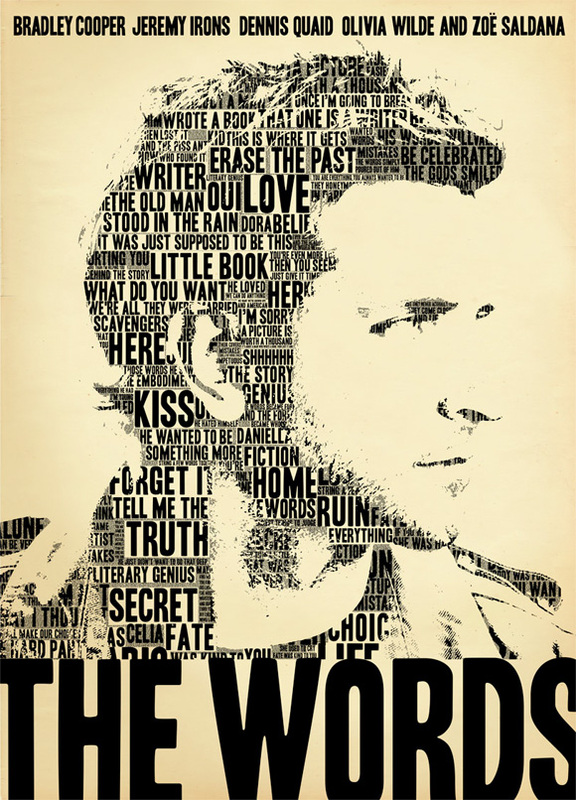 EW has just revealed a spectacular poster for this film about an aspiring writer named Rory Jansen (Cooper) who finds another author's haunting memories in a collection of lost Ernest Hemingway style stories and claims them as his own, propelling him to literary stardom. See it below! Lee Sternthal and Brian Klugman (credited for coming up with the story for Tron Legacy) wrote and directed The Words which has been called both a mysterious romance and a dramatic thriller. Bradley Cooper plays an author who uses another writer's haunting memories discovered inside a valise from an antique shop as his own material and becomes a literary superstar after it's published. Jeremy Irons plays the other writer while Zoe Saldana plays the larcenous author's wife. No release date is set, so stay tuned. a nice, strong look. reminds me a bit of the Tinker, Tailor posters. probably to be replaced by generic floating heads nearer the release date! looking forward to Bradley Cooper vs Jeremy Irons - great casting for their respective roles. plus Cooper's shown good form in stuff like Limitless, and Irons' inclusion should raise everyone's game.